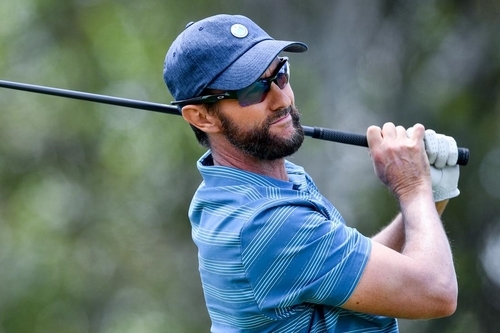 Former US PGA Tour winner Mark Hensby has charged up the leaderboard in his comeback event at the NSW Open in western Sydney. Mark Hensby has made a spectacular return to competitive golf to rocket into NSW Open contention in Sydney. The former US PGA Tour winner is contesting his first event since returning from a year-long suspension for failing to provide a urine sample following the opening round of the 2017 Sanderson Farms Championship in Mississippi. After conceding he made an "an error in judgment" that "had nothing to do with taking a banned substance", Hensby cashed in on a last-minute entry to the Open with a sizzling eight-under-par round of 64 on Friday. After taking a bogey on the fourth, he stormed home in eight under for his last 14 holes to be eight under for the championship after opening with a 72 at Twin Creeks on Thursday. Hensby's round, featuring seven birdies and an eagle three at the par-5 11th, vaulted the 48-year-old up from equal 70th spot into a tie for eighth, four shots behind halfway leader Harrison Endycott. "If you can get some momentum going and just ride it, then you never lose that and it kind of just fell into place today," Hensby said. If he can carry the momentum all the way to the back nine on Sunday, victory would secure Hensby a ticket to next week's Australian Open at The Lakes. Once entrenched in the world's top 30, Hensby is now ranked No.1918 following his ban. But the Tamworth-born star maintains he skipped the mandatory doping test merely in "a moment of anger and frustration", thinking "it was just time to retire from golf" after a first-round 78 in Mississippi left him facing another missed cut. "For quite a long time I felt like I wouldn't ever play again," Hensby said. "Then I was back in Australia visiting family in the middle of the year and I went for a hit and really enjoyed it. "That's when I started thinking maybe I might give it another go. And the last four months I've really put the work in to try to get back." Hensby's best year came back in 2005 when he tied fifth at the Masters, shared third at the US Open, was equal 15th at the British Open and joint 59th at the PGA Championship. But his career went downhill after being injured in a car accident the following year.